Applies to select new 2018 Audi Q5. When you visit Audi Grand Rapids, you will experience the world-class service of a knowledgeable and experienced team. We are committed to offering only remarkable experiences and strive to exceed our customers' expectations. Our website was designed to make shopping for a new or used Audi in the West Michigan area as easy as possible. Our experienced sales staff is eager to share their knowledge and enthusiasm with you. We encourage you to browse our online inventory, schedule a test drive and review our specials. You can request more information about a vehicle or service using our online forms or by calling us at 888-809-3608. We are sure that you will find the right vehicle for you at our dealership. We are stocked with the latest Audi models including: A3, A4, A6, A8, Q5, Q7, and TT, we know you'll be happy with your purchase from Audi Grand Rapids. If you are looking for a used car in Grand Rapids, we have a large inventory to choose from and access to over 900 pre-owned vehicles within the Fox Motors family. From used cars, trucks, SUVs to minivans, our selection has something for every person and need. We offer great deals on all of our Fox Certified, Audi Certified and quality pre-owned cars and can help you finance them as well. Set up a test drive by contacting our friendly sales staff online or by calling us at 888-809-3608 Click here for directions from Grand Rapids, Wyoming MI, Holland, Grandville, Hudsonville, Rockford MI or anywhere in Western Michigan to our state-of-the art facility where you can enjoy free WiFi, freshly-baked cookies, coffee and more. Don't see what you want? Click on CarFinder and complete the form, we will gladly inform you when a matching car arrives. We have access to over 25 locations, 40 brands and over 900 pre-owned vehicles. Everything you need to make an informed decision is just a few clicks away. For a low-interest rate car loan or Audi lease in Grand Rapids, visit Audi Grand Rapids. Our finance manager will do the work for you to ensure you get the lowest possible rate on your car loan. We will work with local and national lenders to provide you with options, from low rates to short terms. Stop by 6025 28th Street SE, Grand Rapids, MI 49546 and speak to our finance manager. An affordable car loan or lease is within reach at Audi Grand Rapids. Do you already own an Audi? Then servicing your new or used Audi has never been easier. Our professional, factory-trained technicians provide West Michigan with quality car repairs and parts and accessories. Keep your vehicle running like new for many miles to come - Any time you want to schedule an appointment or order tires, parts or accessories for your Audi, we're here to help. 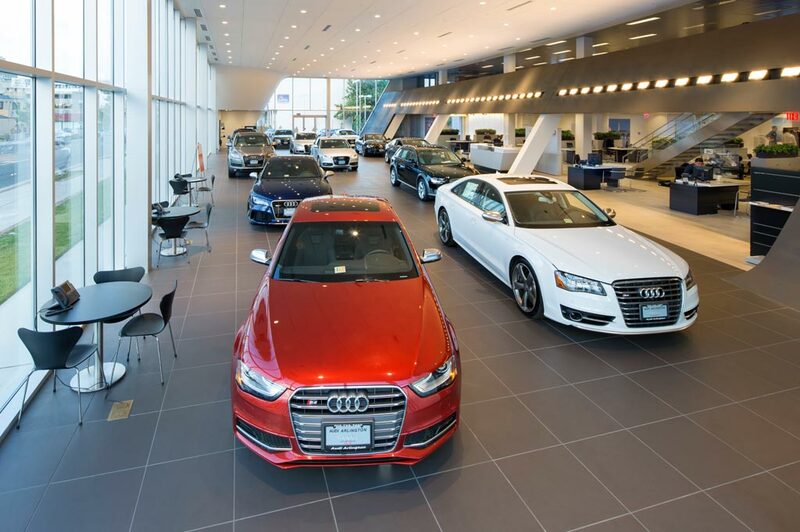 Our Audi dealership is conveniently located on 28th street in Grand Rapids, MI or you can call us at 888-809-3608. Part of Fox Motors, we are one of the fastest-growing dealership groups in Michigan, with over 25 locations and 40 brands available. Fox Motors was ranked 76th in the nation for automotive dealer groups by Automotive News in 2016, and 65th in the Nation by Ward's Mega Dealer 100 in 2012. Audi Grand Rapids thanks our customers for making us such a successful Audi dealership. We hope we have the opportunity to meet you soon at our West Michigan Audi dealership. Our helpful staff is always available to answer any questions you may have about purchasing a new or used car, auto loans, auto repair or auto parts. Learn more about us and come visit us at 6025 28th Street SE, Grand Rapids, MI 49546 for unbelievable deals and remarkable service. Click here for directions from Grand Rapids, Wyoming MI, Holland, Grandville, Hudsonville, Rockford MI or anywhere in Western Michigan to our state-of-the art facility where you can enjoy free WiFi, freshly-baked cookies, coffee and more. We look forward to your visit. At Audi Grand Rapids, we want your next vehicle purchase to be smooth, enjoyable and most importantly, your way! Our online tools to structure your deal let you control your purchase from home, work, tablet or phone, so you know exactly what to expect when you get here. Access these tools from any vehicle details page – just open the tab next to the vehicle's name or choose a tool that interests you from the options listed below. Pick and choose only the tools most valuable to you, and continue where you left off when you get to the dealership. The more steps you complete online, the more time you save at the dealership. You'll be driving away in your next vehicle in record time!